Residents concerned about the safety of an increasingly busy junction in Keynsham have been told a long-term solution will be delivered by autumn. 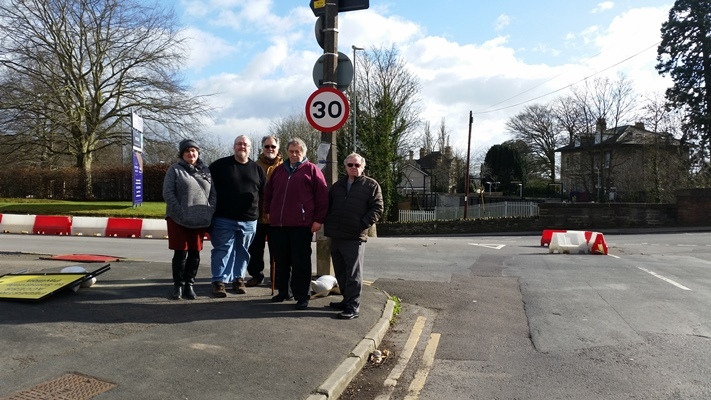 People living near the junction of Station Road and Chandos Road, which also provides access to the Somerdale site, contacted Keynshamvoice in March to raise their concerns that temporary barriers were still in place years after development of the housing estate had begun. They also called for Taylor Wimpey to fulfil promises for a pedestrian crossing to Keynsham Station and presented a petition to Bath and North East Somerset Council urging the local authority and developer to “work together to quickly improve the junction of Chandos Road and Station Road which we feel to be unsafe for pedestrians, motorists and other road users”. In response, the council has said a solution will be implemented in autumn this year while, in the meantime, temporary safety barriers have been installed at the entrance to the Somerdale site in a bid to slow traffic, which will be monitored. Ward councillor Charles Gerrish said: “The problems with this junction have been a long-running challenge which I and fellow councillor Brian Simmons have been pressing council officers to resolve for many months, and so I am pleased there is a recognition that the original junction design needs to be reviewed. “I also welcome the fact that the council has put a timescale on finding a permanent resolution, with council officers stating that they want to work with Taylor Wimpey to agree a design and enable work to commence by autumn this year. Designs for the layout of the junction are now being redrawn as residents and council officers have raised concerns that the original plan for traffic lights, along with a light-controlled pedestrian crossing in Station Road, could affect traffic flow.Taylor Wimpey and the council are now working on an alternative design that would avoid the need for new planning consent and further delays to the scheme.